Heavily marketed prequel to the animated smash hits Despicable Me 1 and 2, featuring the voices of Sandra Bullock, Jon Hamm and Michael Keaton. 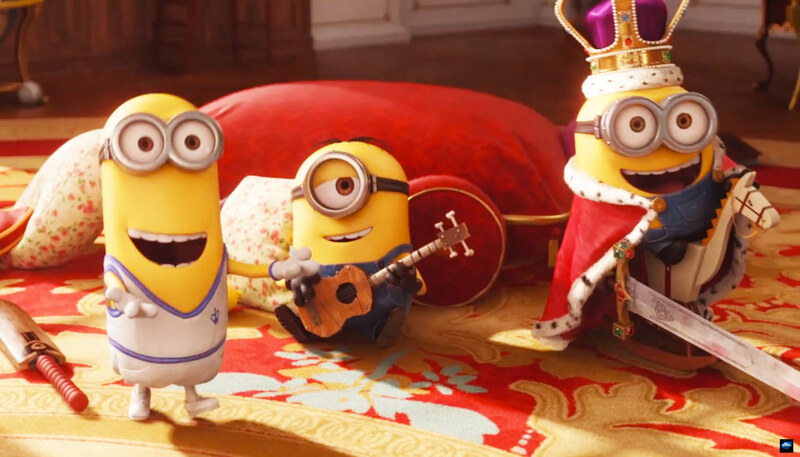 As I sat watching the end credits for Despicable Me 2 way back in the summer of 2013, it slowly dawned on me that I was more excited about the prospects of a dedicated Minions movie than I had been about either of the first two movies, brilliant as they both were. Balancing humour levels to suit both an adult and child audience is always tricky, but director Pierre Coffin and his team have pitched all three films perfectly, though this latest release does seem to lean slightly in favour of the younger kids than usual. That’s no bad thing though: it can sometimes feel like a waste of time and money to take children to the cinema, what with the fidgeting, squirming and wriggling .. and that’s just in the car before you’ve even paid for the tickets, bought copious amounts of confectionery and managed to co-ordinate trips to the facilities to avoid the mid-movie toilet shuffle. With Minions, you can rest assured children aged from 5 to 95 will be giggling throughout and so distracted they won’t even notice when they finally wet themselves with laughter. 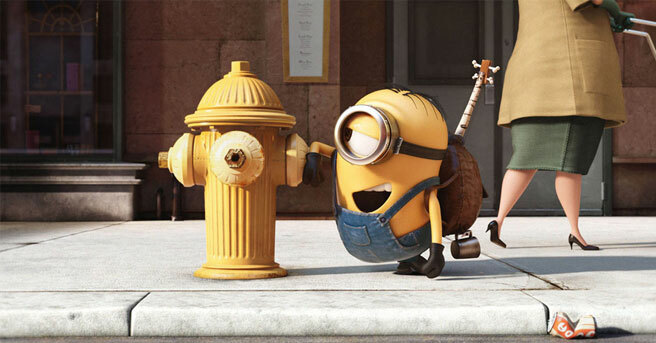 The trailer for the movie was chockful of great gags as it set the scene for our little yellow heroes. Since the dawn of time, their only aim has been to serve the biggest, nastiest, most dangerous “boss” available: if there was a food chain, they wanted to be sitting loyally at the feet of the guy eating at the top table. They begin with a T-Rex, before taking in the Egyptian pharoahs, Napoleon and Dracula among others until they finally run out of bad boys and end up taking refuge during a snow storm in a giant ice cave where they build a civilisation of sorts for themselves. Eventually, boredom takes over and one noble minion, Kevin, stands before his brothers promising to save the tribe by seeking out a new master. To undertake this arduous task, he enlists the help of two chums, Stuart and Bob and before you know it, they’re off exploring the world, hoping to find their chosen future leader. The trio end up in America in 1968, just in time for flower power, Jimi Hendrix, the birth of surf culture and free love .. and a secret villains’ expo being held down in Florida. It’s at this covert convention that they first clap eyes on one Scarlet Overkill, voiced beautifully by the normally angelic Sandra Bullock. With more gadgets than all the Bond movies put together, this gal has set her sights high : namely to become the Queen Of England ! 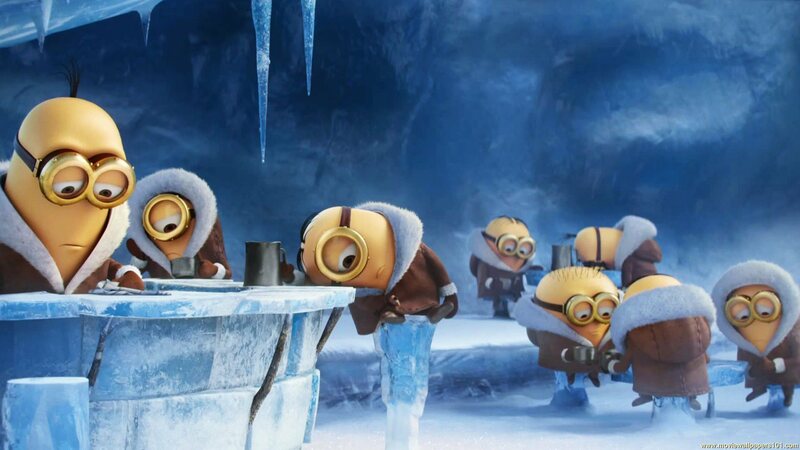 There are loads of set pieces, lots of slapstick gags and a bucketload of mini-moments to make you chuckle and the sheer voice-craft alone is enough to make you admire Minions The Movie. Throw in some genuinely loveable characters with real personalities and a well paced plot that will enrapture both young and old and you know you’re watching an instant classic. 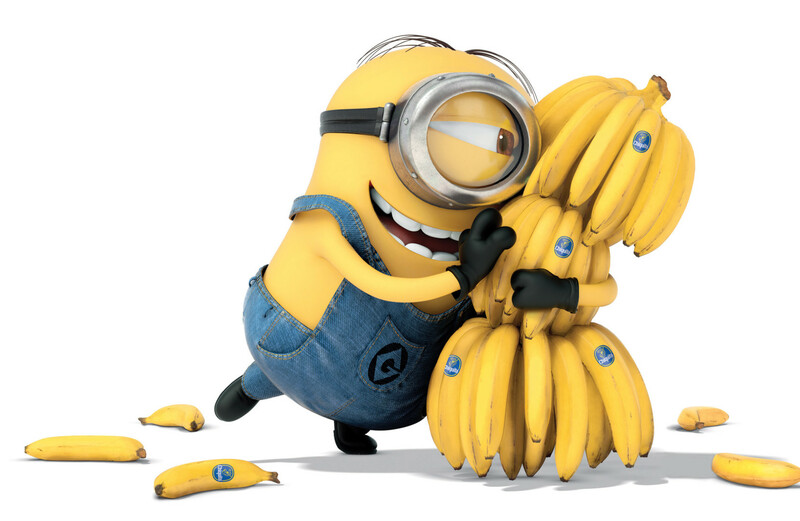 One last thing: it would appear that one man voices every single Minion in this and the two Despicable movies. Let’s just think about that for a moment: one man. All those voices. All those SINGING, CHEERING, LAUGHING voices in all those GIANT CROWD SCENES featuring HUNDREDS of Minions. Add the fact he also directed all three films and you have to take your hat off to the man : step forward, Pierre Coffin, for we salute you, sir.